Food Memories: 242. 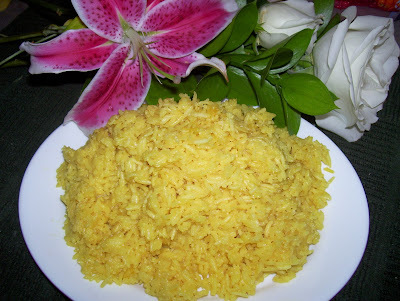 Coconut Rice with Lemon Grass, Wonderful! Lemon grass is a wonderful, fragrant plant that can be found in Oriental grocery stores and other markets. Most of the flavor of this unusual plant is in the lower part of the stalk which should be pale green with rather fat, round bottoms. If one layer of the stalk is pulled away, the bottom of the fresh grass will have a definite lemon fragrance. Lemon grass may be infused in liquids to make a tea, broth, soup or meat sauce. The top of the grass is trimmed as is the bottom, woody end, leaving the bulb. The bulb is often crushed with a mallet or other heavy utensil. This releases the aromatic oils. After the mashed bulb is simmered in liquid, it is removed and discarded. 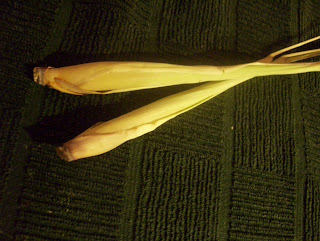 To use lemon grass in a stir-fry dish or salad, simply trim the top and woody base leaving four inches or so of grass. Peel off any dry or tough outer layers before finely chopping or mincing the bulb. Lemon grass is not ruined by long cooking and actually emits more flavor the longer it is cooked. For a less intense flavor, add the lemon grass toward the end of the cooking process. Lemon Grass may be wrapped in plastic and stored for two to three weeks or frozen for several months. The following recipe is for a wonderful, exotic-tasting rice. It is an amazing dish to serve with shrimp or a nice piece of crispy fish (post # 225). Rinse the rice under cold water until it runs clear and place rice in a saucepan. Crush the bulb of the lemon grass and add it and the other ingredients to the rice. Bring the ingredients to a boil, stirring occasionally. Lower heat to a simmer, cover and cook until liquid is absorbed and rice is tender, about 20-25 minutes. Remove lemon grass before serving. Fluff rice. Makes 3 3/4 C rice.